If you love mushrooms – this is the recipe for you. 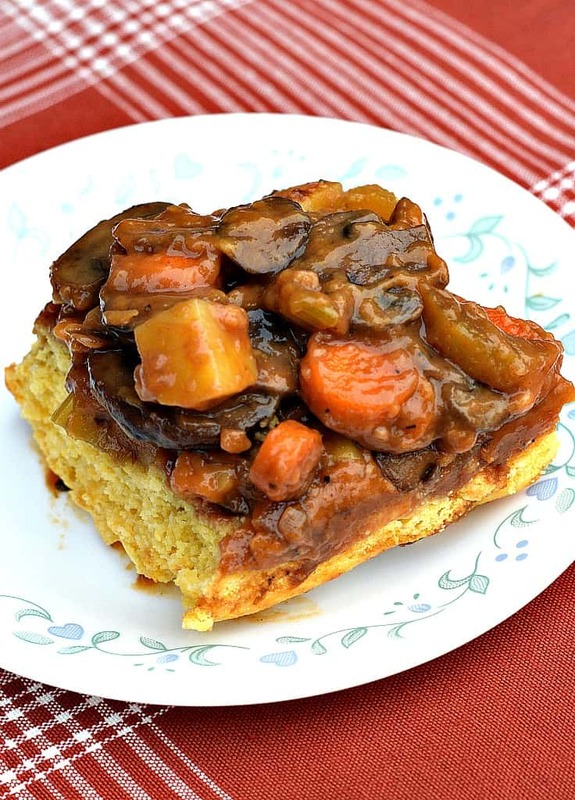 Imagine a rich, savory stew of mushrooms, potatoes, carrots, celery and gravy, and then pour it over a piping hot piece of homemade cornbread. Yeah it’s like that – only it tastes a million times better than I could ever describe. Did I mention it’s perfect for the cooler fall temperatures? And this may just be THE recipe that has even the non-vegans drooling for more. No fancy ingredients, just real food that everyone already has in their cupboard. You’re going to love this one. Saute a few cloves of garlic and about a cup of chopped onions in your favorite soup pan. On a side note – I did use some sweet onions last night – thinking that maybe since my daughter’s Crohn’s Surgery is over and she’s healing so well – maybe she could tolerate a little onion – sweet onion at that. Nope. Back to the Leeks for me. Then add in 16oz of your favorite mushrooms. I used 8oz of Baby Bellas and 8oz of White Button. Add a splash of Veggie Broth to keep things from sticking. Now pour in 1/4 cup of Low Sodium Soy Sauce and let that come to a simmer. This smell alone will have everyone running to the kitchen to see what you’re doing….guaranteed. Add to the pot 4 small stalks of chopped celery, 4 small carrots also chopped, and a diced Yukon Gold potato. Sprinkle in 1/2 tsp dried Thyme, 1/4 tsp rubbed Sage, and 1/4 tsp ground Pepper. Now stir in 1 tsp of Worcestershire Sauce (there are vegan versions available) and 1 Tablespoon of Tomato Paste. Stir everything well so all the spices are mixed in, and then sprinkle in 1/3 cup of flour and stir that until it becomes thick and gummy. Now pour in 1 1/4 cups of Low Sodium Veggie Broth and let it thicken. 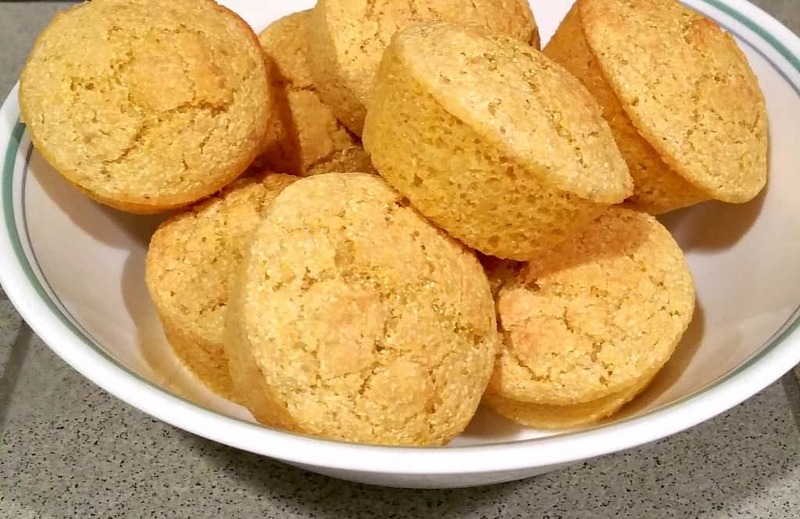 For the Cornbread batter, I used my Country Vegan Cornbread Recipe. Just prepare the batter as directed, and then layer a 15″ x 10″ baking dish with the stew and pour the cornbread batter on top. I constantly hear how people think we deprive ourselves by being Vegan or Plant-Based. I have to laugh – because we are anything but deprived and with every dinner I make – I prove them wrong. Real food, with real ingredients, that taste amazing, with no added fats, oils, cholesterol, or chemicals. A Savory Mushroom Pot Pie stuffed with sautéed mushrooms, potatoes, carrots, celery and gravy, and topped with a homemade cornbread crust. Sounds delicious. How do you think this would do at a potluck? I to attend a non-vegan potluck quite often and like to bring dishes that hold up to not being served immediately as well as being liked by the omnis. I think it would be awesome for a pot luck. Give those omnis something to talk about! I made this tonight for supper and to pack for work lunch. Fantastic! Just one note – the printer friendly piece is missing the soy sauce in the ingredient list. Thanks for sharing this recipe – it will be a staple.